Glendalough is Gaelic for “valley of two lakes” and if you ever get to visit the small town of Glendalough, you will find just that. A beautiful hamlet in eastern Ireland with two lovely lakes nearby. If you are ever fortunate enough to visit this idyllic spot, you will also find the first new craft distillery in Ireland since… well, a gosh darn long time. Founded by “five friends from Wicklow and Dublin,” they began their journey creating Poitín—a traditional Irish distillate made in very small pot stills (sort of like small batch Irish Moonshine). From there it was a short and easy step into a variety of Irish Whiskies and Herbal-infused Gins as well. Everything is made by hand with a good measure of love. Double Barrel is a dream. Distilled from malted barley and Irish corn it gets its beauty rest in American oak first-fill Bourbon barrels before being finished for six months in Oloroso Sherry casks. Expect deep, impactful notes of robust chocolate and caramel with just a touch of fruit and vanilla. 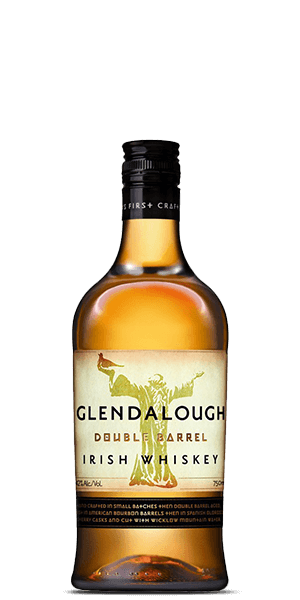 What does Glendalough Double Barrel Irish Whiskey taste like? The Flavor Spiral™ shows the most common flavors that you'll taste in Glendalough Double Barrel Irish Whiskey and gives you a chance to have a taste of it before actually tasting it. Rich with dark fruit; cherry, raisin, fig, Christmas pudding, floral notes, lemongrass, nutmeg. Sweet and creamy, butterscotch, honey, peppercorn, dried fruit, maraschino cherries and a pinch of brown sugar. Lingering ginger spices, subtle almond. This and Teeling small batch are my go-to recommendations for value Irish whiskey purchases. Smooth, with a fruity after taste that is great neat with a dash of water as it is mixed with Ice and ginger ale (a blasphemy back home but a delight I enjoy in the US). Lots of flavor, vanilla and sweet fruit create interest and make this Irish whiskey drinkable for its age. Great tasting and very smooth.